Support Rave by rocking our own Rotterdam Rave merchandise! This unisex hoodie features the Rotterdam Rave logo on the front and the slogan 'Rotterdam is Rave. Rotterdam is techno.' at the back. Hoodie (unisex) Rotterdam is rave. Rotterdam is techno. 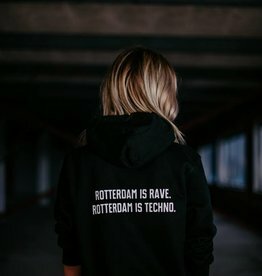 Support Rave by rocking our own Rotterdam Rave merchandise! This unisex hoodie features the Rotterdam Rave logo on the front and nothing at the back. Support Rave by rocking our own Rotterdam Rave merchandise! This unisex hoodie features the Rotterdam Rave logo on the back and nothing on the front.